Georgetown Gives Full-Ride Scholarship To Gay Teen - Joe.My.God. 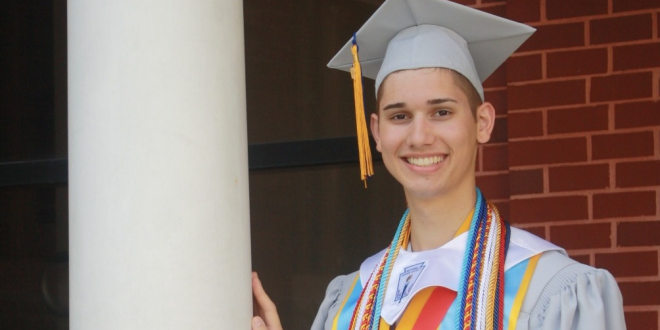 Seth Owen, a high school valedictorian from Florida whose parents ostracized him because of his sexuality, has reportedly been offered a full-ride scholarship to attend Georgetown University in the fall. Owen, who graduated from First Coast High School in Jacksonville with a 4.16 GPA, captured headlines late last month after one of his teachers set up a fundraising page to raise money for his first year’s tuition at Georgetown. Seth says he’s going to set up a scholarship fund for LGBTQ students “who find themselves in the circumstance I was in earlier this year.” He adds that Georgetown is going to help him with that. At this writing, the GoFundMe drive is near $130,000.